Happy Saturday guys! It's been forever and a day since I've posted about beauty/make-up related anything and you know what? That's too long! I thought it might be fun to update you on the products I'm currently wearing/loving daily. In fact, I kind of wanted to do a video to accompany this post, but I'm having a few technical difficulties with my camera. Would y'all be interested in me doing a few videos every now and again to accompany post content? They'd be short and sweet! If so, let me know in a comment! 1. Sephora 10 HR Wear Perfection Foundation (#25 Medium Beige) - I'm on my second bottle of this and still head over heels for it. I've tried a lot of foundation in my 21 years on Earth, but this is definitely top 3. Up until I purchased my first bottle this summer I hadn't worn true foundation in over a year. I was wearing a mix of BB, concealer, and a little powder. That got old, so I decided to give true foundation another go. However, I didn't want to spend major $ on the wrong shade (which was majorly stressing me out, and perhaps why I put off wearing foundation for so long). I went to my local Sephora and had the shop girls swatch me until they found a perfect match. This foundation goes on seamlessly, has medium-full coverage, is fairly lightweight, and lasts all day. I couldn't ask for more! 2. Flower Lighten Up! Brightening Concealer (Shade 2) - This is the first drug store concealer I've tried and actually liked in years! Though it's very different from one of my all time favorite concealers, Tarte's Creaseless Concealer, I am falling head over heels for this one. I have currently just purchased my 3rd tube of the stuff, so you know the obsession is serious. It has great coverage and definitely helps to achieve that illuminated from within look. Perfect for blemishes and dark circles (a major issue of mine) alike! 3. L'Oreal Color Riche Balm (Caring Coral) - I have so many glosses and balms in my possession that it'd truly be embarrassing to go through and count them all. However, recently this balm has truly stood out and I've been going back to it day after day. It's a really subtle pinky/peach color on the lips and it's super moisturizing. It just kind of melts on your lips, plus it lasts a decent while! I find it perfect to wear to school because of how subtle, yet pretty it is on. Definitely wanting to try more colors from this range! 4. Yes to Blueberries Cleansing Facial Wipes - Recently gave these a try and decided I liked them. However, these don't smell like blueberries (at least not to me). On the package it says "with apple and lemon" and I'd definitely say the dominant smell is more lemon than anything. At first it sort of reminded me of a cleaning liquid, but I've grown accustom. These wipes do have a really distinct smell, so if you're not committed to stronger smelling wipes then maybe this one if not for you. However, I've decided that I liked them because they do an excellent job of taking off my make-up AND leaving my face feeling super smooth right before bed! 5. L'Oreal Paris Voluminous Original Mascara (Black Noir) - This mascara has a cult following and I may or may not be a member of said cult. I recently purchased my second tube of this. I bought this over a year ago and remember feeling rather average about it - didn't love it or hate it. I recently needed new mascara and was looking for a cheap drugstore one that'd work in place of nicer one for the time being (I usually get all of my higher end mascara during the Christmas season). I went back to the drawing board and blogger after blogger had nothing but amazing things to say about this mascara. I currently am using the version with the curved brush and really loving it this time around. It's true black, buildable, non-flakey and could easily compete with a higher end mascara. Is it the end all be all? Maybe not, but I'm loving it all the same! And for the price, it's hard to pass up! 6. Benefit's Watts Up! Illuminator - This has been a favorite of mine for about forever. It's just one of those products I just can't stop loving. It lasts a really long time and is perfect for highlighting cheek bones, brow bones, the bridge of your nose, and the tear duct area of eyes! If you love illuminator, but haven't found the product yet, give this one a go! You won't be disappointed! 7. Sephora Microsmooth Baked Blush Duo (Tea Rose Tickle) - I was recently in the market for a new blush since I just ran out of Benefit's Rockateur Blush (one of my absolute faves). Rockateur is rather pricey so I was looking for a somewhat cheaper dupe and I think I may have found it in this baked blush duo by Sephora. The blush goes on smoothly and is very pigmented. It's a great buy and a pretty close dupe, in my opinion, of my beloved Rockateur. 8. Tarte Amazonian Clay Mineral Bronzer (Park Ave Princess) - This is the same bronzer I've been using for years. I've tried two or three others, but I just can't shake this one. It's buildable, versatile, not shimmery, and is just an overall amazing product. I'm probably on my fifth palette of the stuff. It's become a regular in my routine! 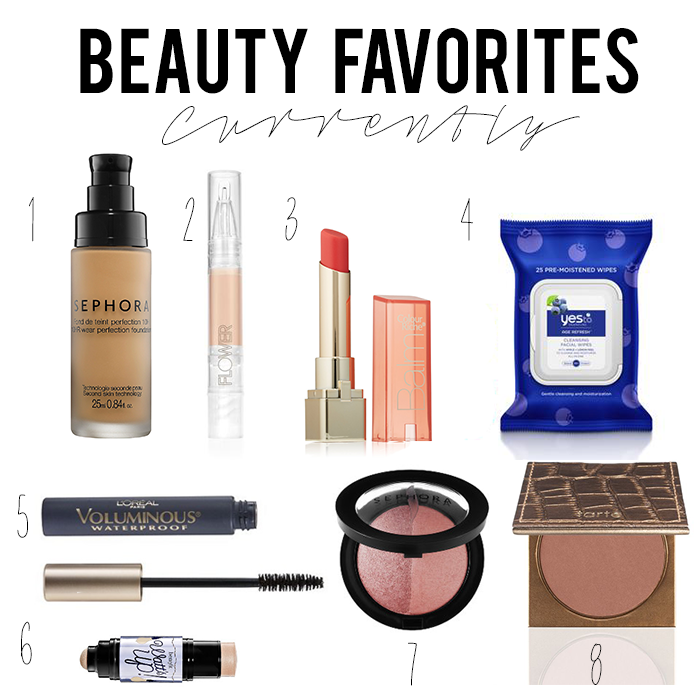 What beauty products are you currently using and loving? Any recommendations? Hopefully I'll be sharing more beauty loves soon!